It was just moments ago since the 'The Oddballs' had celebrated their win in the Christmas Quiz. They had beaten the 'Malvern Mavericks', a formidable opponent, who had won in the two preceding years and were looking good to win again right until the end of the competition. Cheers had rung out as the winning team was announced and the prize money and bottle of bubbly was handed to the victorious contestants. Now the evening was coming to a close and many of those, who had ferociously contested the quiz earlier, stayed behind to clean up and take off the decorations that had been so fastidiously tacked, pinned and sellotaped to walls and fittings by another group of volunteers earlier that day. 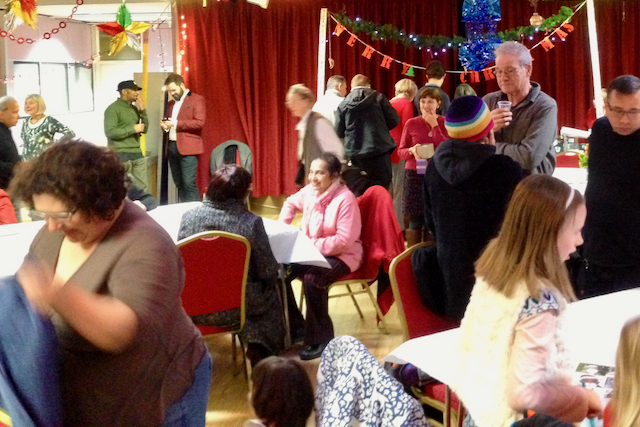 After all, this wasn’t just another night out in the pub, it was an evening with the neighbours, organised by the residents associations of Noel Park and Hornsey Park. 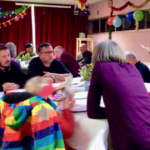 And the feeling of not only taking part, but to be part of the whole event, is just as important as winning in the tombola, or getting one up on the next table in the quiz. Everything was provided by the community. The buffet table was generously laden with home-cooked delicacies; we enjoyed an excellent curry and various salads and quiches, all provided by neighbours. The dinner break during the quiz allowed everyone to make new acquaintances while queuing up for the food and mingling. As always, the tombola was an enormous attraction, both adults and kids got excited about their prizes, unwanted items were quickly swapped for more useful ones, and hardly anyone went home without some consolation prize. The quiz itself had been a tough but entertaining challenge for all 6 teams that had thrown their hats into the ring. Pastor Ryan, who has been setting the questions in several years previously, has by now attained the skills of the professional quizmaster and patiently answered all requests to re-read questions and to spell out words without losing track. But Ryan is not only offering his range of skills for the social events, as pastor of Grace Baptist Church on Park Ridings he is able to provide a room for meetings, he is actively promoting and overseeing the Neighbourhood Watch scheme and regularly helping out with the community gardening projects. Pastor Ryan is part of the Parkside Malvern Residents Association, which was originally started when crime was becoming a serious problem for the area and neighbours got together to lobby the local councillors and police. Regular gardening sessions were introduced and led to continued efforts to brighten up the area, planters were set up and mosaics, created by the Heartlands school, were added to adorn the mostly barren walls of the shopping mall. Moving to the present, Haringey is faced with the most ambitious rebuilding plans for regeneration, entire roads face demolition and development. In these times, residents associations provide focus as residents again gather to make their voices heard and provide their own counter proposals and amendments to protect their neighbourhoods and to improve their environment. Many of the recent development plans have caused concern and anxiety. 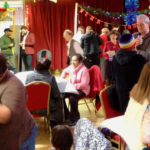 Parts of the community, who fear that the proposed change may either completely displace them, or affect their quality of life in the borough, are again looking to become active in constructive resistance and local political activism. Others see it as a chance to improve the area, allow it to secure its future in a changing cityscape and provide the much needed housing and amenities. With so much tension in the air, it seemed even more important to have a social occasion that was able to show our ability to just be good neighbours, to enjoy each others company and to provide a feeling of belonging when all around us becomes more fragmented and transitory. We are looking forward to be hosting this fun occasion again next year, but of course it will not happen without our fantastic residents donating their time for the organisation and preparation, and just as important, for as many people as possible to come and join in. Let us know if you are interested in helping out, you can join us for the decorating or donate food or gifts for the tombola. If you want to get on our mailing list just drop a note to info@pmra.co.uk and we'll let you know all the details once the time comes around again in 2018. 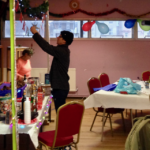 A big thank you to all who helped and attended, to Don and The Hub for providing the venue, Polly for organising the event, Dorothy for looking after the tombola, and our special gratitude goes to Mei, Emma and Anna, who ran the bar. 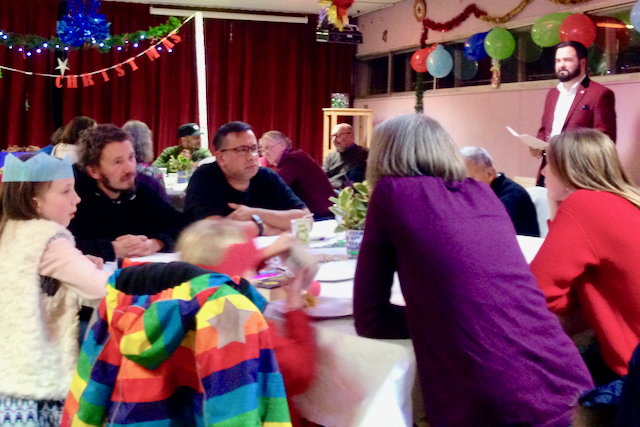 We are grateful to the organisations which supported the event: St Williams Developers kindly provided the prize money for the quiz; Sainsbury's, Wilkinsons, the Big Green Bookshop, and Boots donated items for the tombola.